Schizophrenia: a review of risk factors, cognitive deficits, structural and function abnormalities. Occurring in about 1% of the world’s population, schizophrenia is a disorder of abnormal cognition encompassing oddities in perception, thinking, attention, learning, inhibition, memory, manner relating to and others (Cunningham & Peters, 2014). Traditionally, schizophrenia has been broken down into several subtypes depending on the symptomology expressed (e.g. paranoid, disorganized, schizoaffective, catatonic). The symptomology of the disease is subdivided into both positive and negative classifications, as well as cognitive deficits. Positive symptoms implicated in the disease include delusion, hallucination, disorganized speech or clang associations, whereas negative symptoms include emotional flattening, asociality, anhedonia or avolition (Butcher, 2010). This essay has four main aims. Firstly, while a definitive cause of schizophrenia still eludes us, an abundance of research has identified a wide array of biological and psychosocial risk factors and these aetiological factors will be outlined. Secondly, cognitive deficits associated with the disorder will be outlined. This section will highlight the widespread variety of cognitive deficits presented in patients and discuss some of the batteries of cognitive tests developed in assessing the extent of these shortfalls. Subsequently the structural abnormalities associated with the disease will be briefly revised, along with some of the confines of structural studies. Additionally the essay aims explore whether schizophrenia is a progressive disorder or solely a disorder of neurodevelopment based on structural analysis. Prior to concluding, the essay will review some findings from fMRI studies investigating the functional connectivity within the schizophrenic brain and how they relate to both the positive and negative symptoms presented in the illness. Furthermore, the limitations of fMRI studies, born out of a lack of precision of hemodynamic response measurements will be highlighted by analysing the results of an experiment examining activation during a working memory task. The aetiology of schizophrenia is complex and cannot be reduced down to a single causal factor. This is evident when we consider the subtypes and indeed individual cases of the illness deviate massively in their presentation, responsiveness to treatment and illness trajectory (Moore, Kelleher & Corvin, 2011). An abundance of research into the cause of the disorder suggests that a combination of predispositional physiological factors and a multitude of environmental risk factors result in brain pathways developing abnormally. Schizophrenia is a polygenic disease and thus cannot be explained by one mutated gene. Eyles, Feldon & Meyer (2012) have identified 40 genes implicated in the development of the disease, signifying that it is a cocktail within a certain genotype that confers susceptibility to the illness. A study by Tinari et al. (2004) found that the genotype for higher risk in the illness only resulted in schizophrenia when an individual grew up in a dysfunctional vs. heathy family, suggesting that while biology provides the tinder, environment produces the spark. The dopamine hypothesis has stood out as the more proficient biological theory to date in investigating the causes of schizophrenia. While originally thought to be a functional excess of dopamine, research has indicated that it is actually increased receptor density and sensitivity, (particularly super-sensitivity at the D2 receptors; Wong et al. 1986) that may contribute to susceptibility of the disease (Butcher, 2010). Other successful biologically based studies into the aetiology of schizophrenia include the glutamate hypothesis, hormone studies and twin hereditary studies (see Cunningham & Peters for review, 2014). Although the aforementioned studies and approaches are useful in understanding the illness, they all share a common limitation; they each ignore the environmental and developmental factors that may contribute more to the onset of the illness than genetics (Bagby & Juhasz, 2013). Cannabis use has been closely related to the onset of schizophrenia, with young males who use being at significantly greater risk of developing the illness (Zammit et al., 2002). Moreover, 75% of individuals presenting with first-episode psychosis use the drug regularly (Archie et al., 2007) although some believe the correlation with high usage rates is due to self-medication (D’souza et al., 2005). About 60-80% of schizophrenic patients display cognitive deficits (Lewis, 2004) across a multitude of domains including; attention, memory, processing speed, social cognition, reasoning and verbal learning (Keefe & Harvey, 2012; Green et al. 2004). A study by Keefe et al., (2005) found that 98% of patients perform more poorly on cognitive tests than would be predicted by their parent’s education level. Additionally, a collection of studies have shown that cognitive impairment can reach two standard deviations below a healthy control mean (for review see Keefe & Harvey, 2012). This spread of cognitive deficits manifest itself across numerous domains from social to financial and occupational. For example, poor attention or attentive vigilance may result in an individual being unable to follow instructions or concentrate on a task in an occupational setting, or follow individual or group conversations in a social setting. Furthermore, schizophrenic individuals experience deficits in social cognition that create further difficulty within these settings such as theory-of-mind task performance (Tan et al., 2005) and perception of negative emotions, fear and facial affect in others (Penn et al, 1997). Research suggests that some of the cognitive deficits implicated in schizophrenia may develop prior to the onset of the disorder. A study by Jones & Rodgers (1994) identified 30 individuals with schizophrenia from a random sample of 5000 individuals born in 1946. All subjects had been tested for non-verbal, verbal and reading abilities, arithmetic, and vocabulary, at ages 8, 11 and 15. Their progressively low scores in relation to heathy peers indicated a risk factor for the disease. These results should be approached with caution as a dysfunctional home environment may also affect both the academic ability in children as well as contribute to the onset of the illness. Nevertheless, other research has found similar results suggesting the cognitive deficit in a young person is a significant risk factor (Caspi et al., 2003; Erlenmeyer-Kimling et al. 2000). Although the impact of antipsychotic medications on neurocogniton provides minimal benefits to patients (Keefe & Harvey, 2012), recent research has shown that patients who receive psychosocial support preform significantly better on several cognitive tasks than those who do not, suggesting that such interventions may be beneficial to those suffering with the disorder (Dalagdi et al., 2014). What remains a source of debate within the literature of the brain structure of schizophrenia is whether the disorder is progressive throughout the life-span or is strictly a neurodevelopmental disorder. While the lion’s share of the sMRI research posits that the illness progressively affects both grey and white matter (for meta-analysis see Olabi et al., 2011), others have suggested that the ‘progressive’ structural abnormalities observed could more be a consequence of numerous confounding variables (e.g. low physical activity, smoking, stress, alcohol, cannabis, anti-psychotic medication ; Zipursky, Reilly & Murray, 2012). Furthermore, Zipursky et al. (2012) argue there is an absence of evidence of any toxic effect of psychosis on brain tissue. Zhang et al., (2014) used diffusion tensor imaging and a cross-sectional design in order to investigate whether schizophrenia produces progressive brain abnormalities. They found that schizophrenic patients showed lower fractional anisotropy (diffusion in the cells) values in the corpus callosum and corona radiate, and that these values were negatively correlated with the age of the patient. These researchers used a cross-sectional design and a majority of drug-naïve participants in an attempt to control for any medication effects, however, in doing this they open their results to scrutiny by drawing inferences about differences in two different brains. There are several limitations in structural studies in schizophrenia. Firstly, it’s very difficult to measure the effect of anti-psychotics on the brain without a control group of drug naïve patients. Given the debilitating nature of the illness, it’s difficult to find older patients that have not been medicated for long periods of time. Furthermore, if these patients are severely psychotic, it may prove impossible to test them, meaning some samples aren’t a true representation of the population. Secondly, there are causal problems in the structural studies. Consider, for example, an experiment using sMRI undertaken by Fornito et al., (2012). Their results showed schizophrenic patients have altered interregional connectivity and hypoactivation in the prefrontal cortex. What remains unclear is whether schizophrenic patients have these altered patterns of activation are a cause or are a consequence of the disorder. Schizophrenia is believed to be a disorder arising from disturbances in brain connectivity (Fornito et al., 2012) and that these disruptions prevent functionality in cognitive domains which often require communication between several distinct regions (Konrad & Winterer, 2008). An analysis of resting functional connectivity of the disorder by Venkataraman et al. (2012) posits that patients display two distinct patterns when compared with healthy controls and that these patterns are correlated with the symptomology expressed. Abnormally increased connectivity between the medial parietal and frontal lobes was correlated with the presentation of positive symptoms, whereas decreased connectivity between medial parietal and temporal regions, and the temporal cortex, bilaterally corresponded with the presentation of negative symptoms (Venkataraman et al. 2012). Functional studies in schizophrenia typically use fMRI, which measures hemodynamic response related to changes in neural activity. While their usefulness in neuropsychology cannot be overstated, they are not without their limitations due to their precision. Consider for example the following experiment by Royer et al. (2009). This study found that even though schizophrenic individuals did not perform as well as the healthy groups in the working memory task (n-back), patients that did do well showed hyper-activation in the prefrontal and parietal lobes when compared to the control. Furthermore, fMRI showed increased activity in the superior frontal sulcus (self-awareness) and the posterior parietal cortex (planning of movement, attentional maintenance, response preparation/monitoring; Royer et al. (2009)) during successful trails. Here we run into a problem due to the lack of precision in the fMRI. While we can now observe frontal-parietal over-activation, we cannot distinguish whether this suggests either or both; (i) a compensatory mechanism allowing patients to perform well despite impaired cognitive functioning or, (ii) over-activation in the parietal areas corresponds to the BA 40 area (short term memory), suggesting improved effort (Royer et al., 2009). Ultimately, schizophrenia is one of the most horrific examples of what can happen when the brain goes wrong. The disorder has a huge social and financial burden on sufferers, family members and healthcare systems. While there is no single cause of the disease, at least that we know of, research has shown the disorder to have a wide variety of risk factors in both biological and psychosocial domains. 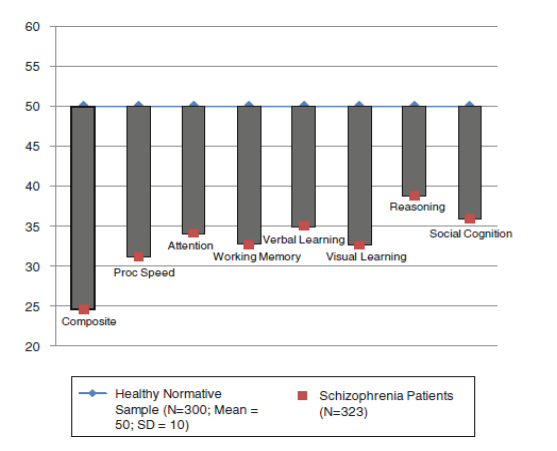 Schizophrenia presents itself in a wide variety of moderately to severely debilitating cognitive deficits although very recent research has shown that psychosocial interventions may at least curve the extent of these shortfalls (Dalagdi et al., 2014), at least in individuals whose positive or negative symptoms are not too extreme. Structurally, schizophrenia can be observed as disorder of compromised white matter integrity (Kubicki et al., 2007), reduced grey matter within the frontal and temporal lobes, hippocampus/amygdala and the thalamus (Shepard et al., 2002) and simple dendritic organisation within the dorsolateral prefrontal cells. The jury is out on whether schizophrenia is a progressive or neurodevelopmental disorder and this is primarily due to the difficulty in controlling for variables such as the effects of anti-psychotic medications, stress, and long term institutionalisation may have on brain structure. The positive or negative symptoms expressed in schizophrenia are related to the functional abnormalities in connectivity between the various brain regions (Venkataraman et al., 2012). While fMRI studies can provide us with valuable clues as to which brain regions are implicated in specific processes, there are issues with precision when comparing blood flow to activation is precise areas. "Schizophrenia: Risk Factors, Cognition and Structure." UKEssays.com. 11 2018. All Answers Ltd. 04 2019 <https://www.ukessays.com/essays/psychology/schizophrenia-risk-factors-cognition-6705.php?vref=1>. "Schizophrenia: Risk Factors, Cognition and Structure." All Answers Ltd. ukessays.com, November 2018. Web. 24 April 2019. <https://www.ukessays.com/essays/psychology/schizophrenia-risk-factors-cognition-6705.php?vref=1>. UKEssays. November 2018. Schizophrenia: Risk Factors, Cognition and Structure. [online]. Available from: https://www.ukessays.com/essays/psychology/schizophrenia-risk-factors-cognition-6705.php?vref=1 [Accessed 24 April 2019]. UKEssays. Schizophrenia: Risk Factors, Cognition and Structure [Internet]. November 2018. [Accessed 24 April 2019]; Available from: https://www.ukessays.com/essays/psychology/schizophrenia-risk-factors-cognition-6705.php?vref=1.